So excited to join with my awesome TpT blogging buddies to bring you this opportunity to NEVER RUN OUT OF INK AGAIN! 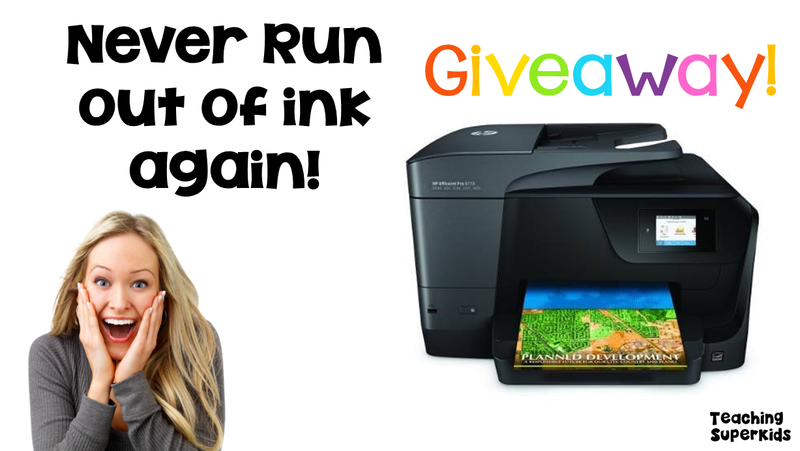 Enter this HP Printer Giveaway and change the way your print materials for your classroom. One of the many challenges teachers face is a limit on copies they can make at school. Most schools don’t allow for color printing. If you want something that involves color you end up paying out of your own pocket to print. Introduce Instant Ink! Gone are the days where you have to make a quick run to Costco or Sams to buy some bulk ink. Did you know that there is a company that will send you ink every time you are close to running out in the mail? Did you know you can choose a package that cost you no more than 2 Mocha Frappe’s will at Starbucks? HP Instant Ink will change your LIFE or at least make the ability to print hassle free! Scream out loud, jump up and down and look like an all-around weirdo (it is okay it really is that exciting)! Once your nice new printer shows up is where you will have your greatest dilemma. HP offers plans to accommodate your printing needs. They have plans as little as $2.99 a month. This plan is for those strange strange people who only print occasionally (not likely to be you). The next tier up is $4.99 for moderate printers. The last one, the one that will make your teacher heart so very happy is their $9.99 a month. So for $9.99 a month you can print up to 300 pages a month. No matter how much ink it requires to print you can print. This printer is so high tech that it will sense when you are low on ink and it sends some out to you BEFORE you run out. Do you print more than 300 pages (at the beginning of the year this is highly likely) no need to worry you can print additional pages; 20 prints for just $1.00 more. The best part is that if you don’t print those 300 pages one month it automatically rolls over to the next month! This is really a no-brainer, no copy code, no black and white only, no “out of service” notice to ruin your awesome lesson plans, and no one looking over your shoulder. Print in the comfort of your own home while binge watching Netflix! I’ve save the best for last, because when you win this new amazing printer and sign up there are super-secret codes (okay not really a secret lol) that you can enter and get several months’ free up front! Some lucky, lucky, duck teachers have gotten up to 10 months of free printing. That blows my mind and makes me so happy that they are getting that many free (aside from the cost of paper) copies. What are you waiting for this is THE giveaway to enter! Co-hosts: An Apple for the Teacher, The Literacy Garden, The Chocolate Teacher, Schoolhouse Treasures, Teaching Ideas For Those Who Love Teaching,Carrie Lutz,Growing Grade by Grade, Mrs Humphries Class, Teacher Gameroom, Julie Davis – Big Ideas For Little Hands,Teaching Superkids, Samson’s Shoppe, Third Grade Giggles, Katie Roltgen, Tried and True Teaching Tools, Teach with Hope, Planet Happy Smiles, Debora Marines TeachMagically, Little Smarticle Particles, and It’s a Teacher Thing. Rules: Use the Rafflecopter to enter. Giveaway ends 9/3/16 and is open worldwide.